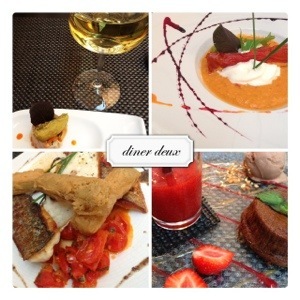 So why Vence? Why come to France after a month plus in Italy? Let’s go back to the planning stage(s) again. By January 2013, the outline of the trip was pretty much nailed down and it was tutta Italia. And then inspiration came from someone else. Henri Matisse. Early in the fall semester, we began studying Henri Matisse in Art III. Matisse had long been a favorite of mine. I was visiting Washington D.C. with Mom and Dad in, I will guess and say, 1986? One day while Daddy attended a no doubt thrilling auditing conference, Mom and I sought refuge from the oppressive heat in the National Gallery. I have a strong memory of seeing a Matisse for what I remember as the first time. You would think I would remember the exact painting, although I think it was “Still Life with Woman Sleeping”, I cannot be certain. What I do remember are the colors, the unmistakable use of black line simply, yet fluidly rendered to create the feminine form. I remember being able to see the cloth of the canvas where the paint on the brush had run thin. I remember staring at his signature. I remember the mood; the mood in the painting and the mood it evoked. I was excited to introduce my students to Monsieur Matisse. In preparation for this introduction, I viewed a documentary, A Model for Matisse. The film highlights a little known and tender relationship between Henri Matisse and a Dominican nun, Sister Jacque-Marie. After I viewed this, I felt as if I had spent an evening with Grandma Guidry. Sister Jacque-Marie reminded me so much of her. I bought the dvd, shared it with my students and mom and dad. 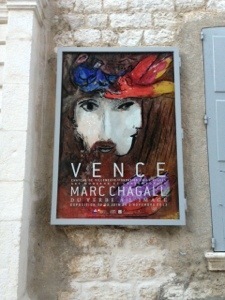 I was aware of the chapel of course, but the film was the inspiration for my visit to Vence. So fast forward to Sunday morning. Last night, I was reading a bit about the area, noted the limited hours of the chapelle for tours but also noticed mass on Sundays at 10:00 am. I did not want to get my hopes up, but I thought how wonderful that would be. 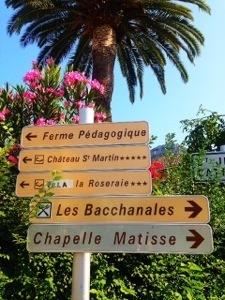 I assumed it would be a short bus ride over to the chapelle, having spied it on the opposite hill last night. But at breakfast, I was told it was a short 15 minute walk (he later added 15, 30 an hour? to his declaration). I like the idea of walking. I feel more in control that way. As I followed my hand drawn map, stopped every once in a while for support. There was one woman that actually looked at my information and tried to listen to me. 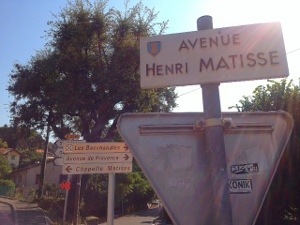 After a moment she said, “Aaaahhhh Matisse.” It was as if she knew him….listening to her say his name was beautiful. She continued on in French, but smiled and nodded making me feel I was heading in the correct direction. 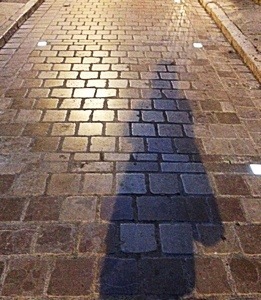 While I walked, I still had no idea regarding the protocol of attending mass….I continued to keep my hopes at bay. 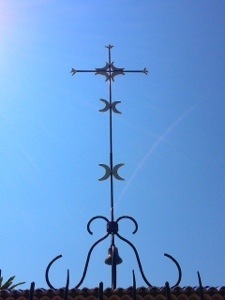 But RIGHT when I arrived, a woman came from the chapelle, unlocked the gate and welcomed the few waiting in….I just followed. 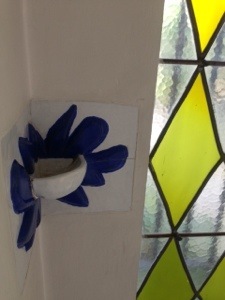 Photographs in the chapelle are strictly forbidden…that means that the people that just entered a church, made the Sign of the Cross and prayed and prayed….disregarded that commandment…..however, I could not bring myself to do so in the chapelle proper. 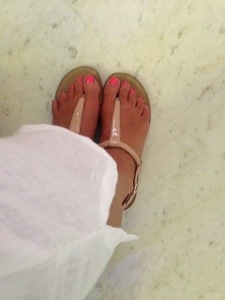 I took a couple of photos before entering, in the foyer, and one of my feet as I stood. The other photos I have are poor ones from the internet, but I wanted you to be a little familiar if you were not. Entering, I was prepared for the stark design and lighting. What I was not prepared for was the size of the chapelle. It it tiny! I would say it is a bit larger than our living room and kitchen put together, a bit wider, but that is it. A photo without the chairs for mass. 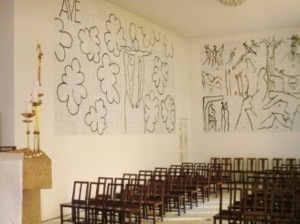 The tile walls with Matisse’s drawings of Mary and Jesus and on the back wall, the Stations of the Cross simply drawn in his unmistakable style. 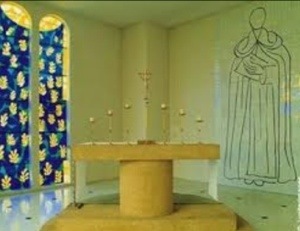 The alter and tabernacle with the sun from the stained glass shining in. I was struck by the appropriateness of ending my visit of cathedrals and attendance at several masses in stunning, grand surroundings at this simple, beautiful chapelle. From Papa Francesco to this very personable French priest. It made me smile. It was still early, about 9:40. I secured a spot and then walked back to the door of the confessional. I think of all the aspects of the chapelle, the door is my favorite. So simple, patterned of course and white. As the chapelle began to fill, an older man walked through greeting everyone. He would shake hands, ask where they were from (in french) and then speak briefly to them, myself included. When we spoke, he said, “oohhh la la people from United States, Spain, England, France….oooohhhh la la”. As I suspected it was the priest. And if that was not enough…..He made sure I heard the message. They passed out the readings in each language needed. Did He choose this for me!!??!! As the mass began, I could tell although I could not understand a word, this man was speaking to his parish….in such a small, intimate setting, he would speak, ask questions (even thought EVERYTHING in French sounds like a question to me) and people in the church would answer…there was interaction going on…it was wonderful. He would laugh, they would laugh. He would ask, they would respond. He would ponder, they would nod their heads…. 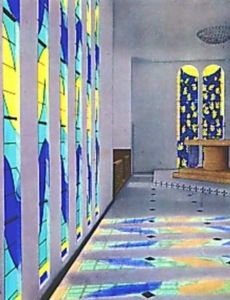 EVERY aspect of the chapelle was a collaborative effort between Matisse and Sister Jacque-Marie, including this cross, the chalice and candle sticks on the altar and the vestments. Even if you are not into Matisse and art, I recommend seeing “A Model for Matisse”. I am happy to lend you my copy or you can rent it on Netflix. After mass, I returned to the historic center of Vence, walked around a bit (again, A LOT of things are closed on Sundays) and decided to “visit” another artist, Marc Chagall. I do not know much at all about Chagall, but everything I have seen on his personality point to a very happy, playful man. And when there is a special exhibit in your own “backyard” why not right? Got in bed with a new good book and listened to the church bells ring all night (that is not a bad thing). 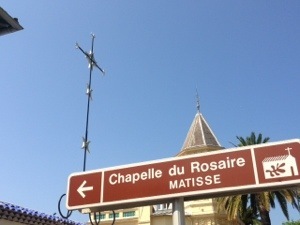 This entry was posted in Uncategorized and tagged Chapelle du Rosaire, Henri Matisse, Italy, Vence by paigetc. Bookmark the permalink. Mike only remembers you saying “I never saw so many goobs in all my life”. Glad you discovered Matisse on your trip to DC and found him again on this trip.